I was surprised when someone wrote and asked about this one, saying that he doubted it was a genuine quote from the Buddha. It had never occurred to me that anyone would think this was a Buddhist quote and I’d never heard this described as Buddhist. And yet, seek, and ye shall find (also not one of the Buddha’s). It turns out that it’s all over the internet, including on at least one quotes site, although as a “Buddhist proverb” rather than directly attributed to the Buddha. But the quote is also ascribed to the Buddha, not just on websites, but in several books. In 1875 Helena Blavatsky, Henry Steel Olcott, and William Quan Judge co-founded The Theosophical Society. Blavatsky combined Eastern religious traditions with Western esoteric teachings to create a synthesis she called the Perennial Religion. She developed this in Isis Unveiled (1877) and The Secret Doctrine (1888), her major works and exposition of her Theosophy. In a Masonic publication from 1922, The New Age magazine, we also read “It is said, in what is called Occultism, that when the pupil is ready the Master will appear.” “Occultism” here is another term for Theosophy. “When the pupil is ready, the Master appears” is an old Theosophical statement, and I have been able on several occasions to prove its truthfulness. is a contributor to the Oxford English Dictionary, Dictionary of American Regional English, Historical Dictionary of American Slang, Yale Book of Quotations and Dictionary of Modern Proverbs. Since 1990 he has also been a regular contributor to Gerald Cohen’s Comments on Etymology. He is recognized as an expert on the origins of the terms Big Apple, Windy City, hot dog, and many other food terms, and he is an editor of the Oxford Companion to American Food and Drink. From page 48 of Light on the Path, by Mabel Collins. Mr. Popik traced the quote further back, to Light on the Path, by Mabel Collins. The third edition, which is on Google Books, is dated 1886, although presumably the first edition was published at least a year earlier. Light on the Path is an odd work, describing itself as “A treatise written for the personal use of those who are ignorant of the Eastern wisdom, and who desire to enter within its influence.” The title page of the book is inscribed “Written down by M.C., Fellow of the Theosophical Society.” Why “written down by” rather than “written by”? The Theosophists claimed to be in contact with “Masters” or “mahatmas” in the East who dictated works to them. Therefore, M. C (Mabel Collins) presents herself not as an author, but as the Stenographer to the Awakened. Faking an entire Sutra takes Fake Buddha Quotes to a whole new level! Madame Blavatksy, Fake Buddha Quoter Extraordinaire, I salute you! So far as I can remember I wrote you that I had received “Light on the Path” from one of the Masters who guide Madame Blavatsky. I wish to ease my conscience now by saying that I wrote this from no knowledge of my own, and merely to please her [Blavatsky]; and that I now see I was very wrong in doing so. Blavatsky herself maintained her cover story to the bitter end. This is a great way to uncover old phases – I too thought it was an old buddhist teaching – I like how you put your articles together – well done! So would you attribute, then, the quote to MC or Blavatsky? I’d attribute it to MC, Sairah. Though, since Theosophy admittedly gleaned their teachings from ancient philosophies, beliefs and religions, I think it may still be possible that the idea of this quote might still have come from some ancient text. Did Mr, Popik eliminate all other source texts? I don’t want to belabor the subject, and question the stated assertion that it is not Vedic or some other ancient quote, it has some import to my research for a book I am developing. Thanks. If this quote had originated in the Vedas, or some other ancient source, it would surely have come to light by now, Linda. In that particular context, what Thich Nhat Hanh is talking about is how the human body arises in dependence upon causes and conditions, and then ceases to be (dies) when those conditions can no longer be sustained. And so, in a sense, any perception we have of the body as a “thing” is just a snapshot, losing a dynamic appreciation of the body as part of the cycle of the elements. It isn’t connected, in any way that I can see, at least. with the idea of the teacher appearing when the student is ready. I’d also very much doubt whether this is something the Buddha said. Thay’s books seem to contain a number of paraphrases masquerading as quotes. I think what happens is that he gives a talk in which he says “The Buddha said…” and then gives a description, in his own words, of a Buddhist teaching. Then when his editors are turning his talks into books, they take these as actual quotes. I’ve seen several instances of this. Most interesting! Do you mean Longchenpa, Khamsung? Which text is that, and is it available in English? It’s extremely unlikely that Mabel Collins would have had access to any Tibetan texts, so this may just be a coincidence. But you never know. finally, someone cleared this one up. we’re back to references (radiocarbon) to him made in 6th-century bc. He probably said something like that for the very simple reason that it’s an element of the core of understanding Buddhism and the statement is made when talking about that progression. Please help me out if this is cleared up, Joel. Who is this “lengthen pa” that Khamsung is talking about, and what’s the “Yhedshen zhod”? Of course if this saying is, as he says, from the 3rd century then of course this doesn’t affect the fact that this quote isn’t from the Buddha. But it would be good to know if it quote does have a source in a Buddhist text. Do you have a source for that assertion, Daniel? Thanks, Bill. That’s later than Collins’ book, of course. I wonder if she was one of the sources the “three initiates” drew on? Or perhaps they just picked up on the phrase somewhere after it went into circulation. This comment is several years too late, but the Kybalion was published long after Mabel Collins’ “Light on the Path.” The saying would have been well known by 1912, and could have been borrowed from any number of places. I’d like to know what that text is, Khamsung. I prefer to look at primary texts rather than simply take people’s word. It’s nothing personal — just that our recollection is often faulty. Please do let me know! Its all from ancient Egypt…that’s who Crowely and Madame B were most influenced by 🙂 Hermetiscm and Hindu philosophy are their basis. And Daniel is correct…. Claims like this aren’t really meaningful without a source, Amelia. Anyone can make a claim that the quote came from a particular source, but those competing claims simply muddy the waters unless you can point to an actual text (rather than, say, someone else repeating the same claim). I can’t wait to read what the next comments and discoveries might be. Can one really claim that any spiritual teaching are plagiarized? Plagiarism implies that one person owns the work. Surely concepts like “all is one” or “god is love” cannot be attributed to one person, regardless of who wrote them down. The entire history of spiritual knowledge, going back to the first cave paintings and art forms, in little more than an attempt to understand the same concept within the contexts of the current culture. When John Wheeler called Richard Feynman as 2AM in the spring of 1940 and said, “Feynman, I know why all electrons have the same charge and the same mass” “Why?” “Because, they are all the same electron!” was he plagiarizing whomever was the first to say “all is one”? The charming example you quote from the interaction between Wheeler and Feynman is clearly not plagiarism. Plagiarism is taking another person’s words and claiming them as your own. If Blavatsky took passages from other people’s works, cobbled them together, and said it was her work, then this is plagiarism. Concepts can’t be plagiarized, although specific wordings of those concepts can. Actually, concepts can be plagiarized! You can take someone else’s ideas, repackage them, and claim they’re original to you. But what Blavatsky was accused of was copying entire passages wholesale, not merely recycling ideas. This comment is regarding the reference made to “seek and ye shall find”. That is a quote from Jesus, The Christ in the Holy Scriptures recorded in the Gospels of both Luke and Matthew. Both Luke 11:9 and Matthew 7:7 record, ” Ask and it will be given to you; seek and you will find; knock and the door will be opened to you.” The next verse in each reference continues on with this message. The above quote is taken from the New International Version translation of the Holy Bible. Hi, The gospels of Matthew and Luke do not specifically read ‘the teacher/master will appear’ rather these gospels encourage people to continually ask, seek, and knock to find the truth. Good to see this happening on this forum. This website is great, both ‘Fake Buddha Quotes’ and ‘Real Buddha Quotes’. There are many ‘Buddhist’ quotes in Social Media and this website allowed me to see which quote is a genuine quote from the Lord Buddha. This is a great deed, all the best on your journey to open eyes! It’s best to just credit some “wiseman or person once said” then specifically naming them because “Once a wise person said if the shoe fits wear it”! The first time i read this phrase, was in a book by Nikolai Berdyaev (1874-1948). I did try to find the title of the book, but it was soooooo many years ago. He may well have used the phrase. Many people have. Berdyaev’s first publication came out several decades after Collin’s book was published, though. Whomever first said it, can anyone argue that it does not hold true and then explain why it does not hold true? This site is full of replies/comments from unready and ready pupils and madters. Receptivity opens up to absorption of knowledge. Rejection/resistance nullifies any attempt by anyone to spread wisdom. See how difficult it is to get this idea acceoss! So go for it, use the fake proverb because it reflects a truth. Anyway, my only concern is that people not attribute the quotation to the Buddha, since it’s not something he said. Isn’t all so called knowledge subjective? If, for instance, I (like so many people I know) refuse to accept the scientific method as the ultimate system of knowledge; i. e., Arriving at conclusions about our observations and predicting outcomes from the knowledge gained, and instead rely on superstition and fallacious appeals of one kind or another, how will anyone or any force cause me to accept that as gospel? Until I choose to recieve and assimilate incoming knowledge am I not immune to it? And how can anyone teach me or cause me to see their truth if I reject all attemts at such? I don’t think anyone can force another person to accept reason or observation. I think you will find the word ‘gospel’ means good news rather than specifically ‘true’. Although as a whole their message is said to reinstate the truth, to a nation who had deviated far from it. Matthew and Luke do not say ‘the teacher will appear’ rather it encourages people to continually ask, seek, and knock to find the truth. It is very hard to find the originator of a quote or idea, yet often easy to spot who isn’t. I am very grateful for forums like these where the truth has been searched for. Christians say theirs is the only gospel and all else is false. Whether they read it out of a book or hear the so called gospel from a preacher don’t they have to process that and come to a conclusion about its varacity in their own minds? I have never heard anyone attributing this quote to Buddha. Blavatsky, who is one of the greatest thinkers of the last millennium, and who the Catholic Church made great efforts to denigrate precisely because she exposes in her works the fraud Christianity and the church are, she too never attributes this quote to Buddha, and your material actually acknowledges that. So, you certainly don’t have a case here. More so, when you put the stamp FAKE over the saying, as you do in your meme, the implication is that the saying is not a word of wisdom. It certainly is, and its message is, when one reaches a certain level of enlightenment, he is ready to make advancements with his cognitive growth. Just because you’ve never seen anyone attributing this quote to the Buddha doesn’t mean it doesn’t happen. Here are a few examples for you. I never claimed that Blavatsky said this was a quote from the Buddha, so I’m not sure what you mean by saying that I “don’t have a case.” That’s not a case I tried to make. That the “FAKE” stamp on the image means that the saying is not an expression of wisdom is your inference, not my implication. Questioning the authenticity of a quote’s attribution, which is my task here, is completely different from questioning its validity. Well, by my count it’s only 14% of the article that’s dedicated to discrediting Blavatsky, but let’s not quibble about that. However, there is no implication in the articel that she started this quote. I think I make it quite clear that Mabel Collins was the author. 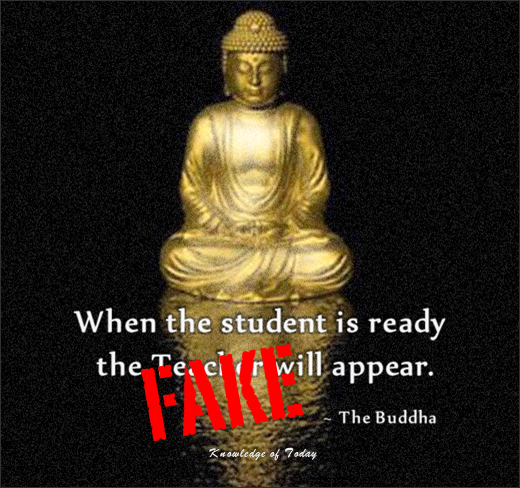 “Faking an entire Sutra takes Fake Buddha Quotes to a whole new level!” is a reference to the “one work she claimed was a translation of a Tibetan teaching,” not to Mabel Collins’ book or the quote that’s being discussed here. First of all, how did you figure out it was 14%? You looks like you also are very poor on statistic. After the first paragraph, the rest of the post is dedicated to attacking Theosophy and Blavatsky, the one who founded the famous Theosophical Society of New York. That would make at least 80% of your post. Once again, you claimed you never said she said that was a Buddha quote but you keep accusing her that her allegedly “faking” a whole sutra (where is your evidence? ), a sutra that has nothing to do with Buddha, she is taking Faking Buddha Quotes on a new level. Kind of illogical, don’t you think? If you put the stamp “FAKE” over the quote, as you did, no matter who you spin it that means the quote is a fake. Had you put an “X” over the name Buddha, we would have understood this quote is wrongly attributed to Buddha. The very use of the word “fake” on your blog is disingenuous, actually wrong. Fake means fabricated, which is not one with being wrongly attributed to someone. Last but not the least, the only one who would have a vested interest in denigrated Buddha and words of wisdom associated with Eastern philosophy would be some kind of Christian church. The entire history of the Christian church and of Orthodox Judaism is an effort to denigrate and distort Buddhism, concepts of Kundalini Yoga, Taoism and Confucianism. It worked with the poor in spirit. Never with the educated ones. I selected the part of the post dedicated to Blavatsky, did a word count, and factored that as a proportion of the total. It came to 14%. You’re losing focus here. You were asserting that I was claiming Blavatsky as the author of this Fake Buddha Quote. I clearly wasn’t, and now you’re flailing around, quibbling about what the word “fake” should apply to. “Fake” in this context means “falsely attributed.” That’s what the site’s about. If you don’t agree with that definition, you’re of course free to start your own site. The implication that anyone interested in clarifying which quotes are falsely attributed to the Buddha must be part of a Christian church is rather hilarious. Thank you for the chuckle! Would you be kind enough to enrich this article on Wikipedia with an update from your article as i see it can be a valuable add to it, and great great article and nice form, thanks for all the effort. Hi, Mo. The link you provide wasn’t to Wikipedia, but in any event Wikipedia isn’t something I have an interest in contributing to. It’s too easy for someone with an agenda to undo something you’ve contributed. I was actually searching for this quote to post on a friend’s Facebook page when I came across your article. First, thank you for keeping me from attributing it to the wrong person, as I am usually quite careful about such things. Second, I enjoy much of the discourse that follows your article; nevertheless, I’ve never understood the need of some people to denigrate others’ arguments….you handle it very well. Nice job. Thank you, Bodhipaksa for a most interesting post. I would have liked to have read a bit more about Madam B and the Star in the East and possibly her discovery of Krishnamuti and his teachings. Didn’t she claim he was the new Christ which he later refuted in old age? I cut my acolyte teeth on those books and they evoke pleasant memories. Guirdief ( sorry, I forget how to spell it) and some other fellow also figure in the story. Anyway, my quote is, ‘never let the truth interfere with a good story.’ ? I have a quote that you can attribute directly to me: you don’t really know a faith until you are completely submerged in it! I actually started to wonder, irregardless of who said it, is it true? Does the master appear when the student is ready? How would you know? 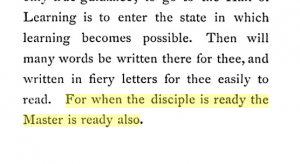 It’s impossible to quantify or define “readiness.” The likely problem is of adopting a circular argument where “obviously” the student is not ready because the master hasn’t yet appeared. Why are so many people upset that this is not a Buddha quote? It is not, it doesn’t exist anywhere in the scriptures and its quite out of line with Buddhist teachings.